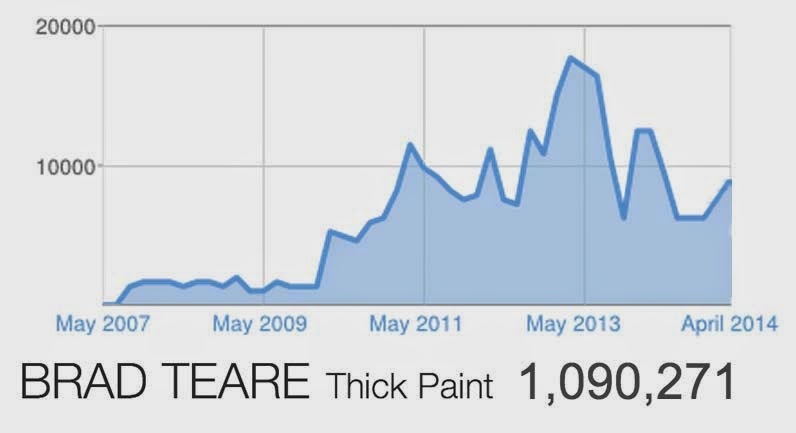 A few weeks ago the Thick Paint blog logged over a million visits. In the blog's seven year history it has had visits from nearly every country on the planet. My brother Steve drafted a series of questions to commemorate the event. STEVE TEARE: You just passed a big milestone with your Thick Paint blog. Tell us about it and what it means to you personally. BRAD TEARE: One million is a lot of visits. I have trouble wrapping my head around those kinds of numbers. But more than anything it suggests that a lot of people found the information useful. That's very satisfying to me. I'm most proud of the innovations I've been able to share with fellow painters. Hundreds of people have emailed to tell me of their appreciation. I still feel that impressionist landscape painting has a great future. It's evolution will only stop when artists abandon its development. ST: What are some of the entries that pull in the most viewers? Why do you think those are so popular? BT: By far the most popular entry is Getting Greens Right. I'm not sure why it's so popular except that it's a recurring problem for most landscape painters. Gayle Faucette Wisbon has linked to my site occasionally via her association with FASO and that has consistently created spikes in viewership. James Gurney linked to my Concert Window events which made them very successful. Meena Das Narayan, editor of Gulf Connoisseur, linked to my site and created a lot of international attention. Some topics don't get many views yet I think they are extremely important like the videos on composition. I made them because my compositions were getting cliched and I had to rethink the whole subject. But I suppose it's a little like getting people to eat their broccoli. ST: Quickly give us a brief history of your blog. When has it been easy or hard and was there a pattern to when those times occurred? BT: As you may remember I launched the blog after you suggested several times that the future of internet presence depended on having a blog. I resisted the idea for quite a while. It seemed like a cliche at the time as I imagined the only blogs people would be interested in would be about internet culture. But I decided the idea of a blog was neither good nor bad–it was what I did with it. From the start I wanted to make a blog that would have been helpful to someone like myself when I was younger. I wanted to provide information to artists who had difficulty finding resources to push their artistic projects forward. I think I've filled a very small niche in the creative ecosystem. I'm actually surprised it's been as well received as it has. There were moments when I've been discouraged and slacked off. But I've always gotten a second wind and pushed forward. In the back of my mind I thought some of the topics would make a good book. That idea keeps me going when other motivations fail. ST: For other artists considering a blog, what kinds of tips would you give them that you've learned on your journey thus far? BT: Authenticity is a buzzword we hear a lot but it's absolutely essential to creating a viable blog. Authenticity as a core value is here to stay simply because the internet has allowed for greater transparency. It's much harder for corporations to manipulate the public simply by pouring money into an idea. I love the idea that authenticity is something huge corporations can't manufacture. It gives smaller players a voice where before we would have been drowned out by their massive PR campaigns. Another thing is if you feel compelled to write a blog just do it. I believe in the concept of frictionless creation which means that occasionally creative ideas get published prematurely. But it is better to get the process started rather than procrastinate with a great idea. ST: Where does your content inspiration come from? BT: I try to read widely and consciously pick books outside my reading list. That is a major source of ideas. Ideas are like electron scattering. One idea hits you and several others are cast off as well. I carry an iPhone everywhere and when an idea hits I use the voice recognition feature to make notes in Evernote. I have a massive list of topics that range from the practical to the philosophical. I do a lot of musing in that list and not every topic will make it into print. But lately I've been writing down topics that relate to engaging with collectors and how to advance one's art project economically. I'm focusing much less on the strictly technical which in some ways is fine since I've covered that area fairly well. Although coming up is a video on a new medium recipe I've found to be superior to earlier versions. I'm a tinkerer so I'm sure there will always be a technical component to the blog. ST: What do you feel is the single biggest benefit to you from starting and maintaining your blog over the years? BT: Without a doubt I have been the greatest benefactor. My work has really improved over the last five years and it has given me the impetus to really fine tune my technique. It gave me a focus I wouldn't have had otherwise. I wouldn't be the painter I am today without this blog and the participation of readers and viewers. ST: If you were to start fresh, would you do anything different today? BT: I would say to think carefully about which platform you use. If I could start over I would go with Wordpress and Vimeo rather than Blogger and Youtube. Blogger and Youtube are both owned by Google and have proved indifferent to small-scale bloggers like me. I would always use my own music which I would make in Garageband. With the early videos I used a variety of copyright free music but people would nevertheless tag some videos with copyright violations. It just isn't worth the hassle and most of the copyright free sound tracks aren't that good any way–if only because they get overexposed. I would love to work with a musician seeking some exposure via the blog but no one has stepped forward. ST: What are your plans for the future? BT: Some videos–especially the ones about my abstracts–give the impression I paint them in fifteen minutes or so which is not the case. I'd like to create something that more nearly recreates the actual experience of painting. I imagine such videos would be of more interest to collectors but I won't know until I try it and see what happens. I would also like to make more professional intros and outros, with a bit of very inconspicuous animation. I'd like to do some longer videos with very subtle ambient soundtracks. In general I'm becoming more interested in how to attract people who are not artists but who nevertheless really love the art process. This would mean the blog would become less technically oriented and more philosophical. Thanks Brad...your insight has lifted my ideas and has made me better able to create a painting that I'm please to look at after one year of effort...it's way harder than it looks. How can I purchase one of yours? Congrats on the milestone, Brad. With continued organic growth, I'm sure you'll be hitting eight figures before you know it! Congrats Brad. The view counts are a testament to a deep-seated need among artists that you have been able to meet. This has become my favorite painting-based blog and honestly I wish there were more like this available. It has inspired me to explore the incorporation of video and technical information into my own blog, to make it more interactive. I didn't know you had a blog. I just voted for your self portrait at http://theartingblog.blogspot.com. Nicely done! Let me know how you do. Unfortunately I didn't make the final cut. I still appreciate your vote. Support means more when it's from someone that I respect. I've only just discovered this blog Brad and I have to say I will be subscribing and returning again and again! I've only read the first few of the posts and already learned a huge amount! Thankyou for sharing and congratulations on your 1,000,000 views, well deserved! Linking from my own blog to this one, if you don't mind. Thanks Tom! Glad to have your input on the blog.